Russian surface-to-air missile. Fourth generation surface-to-air missile system that replaced the Army's S-300V (SA-12) and the Air Defense Force's S-300PMU (SA-10). The system would feature twice the engagement area of the S-300PMU. Initial service was by the end of 2007. AKA: 9M96;SA-20;Triumf;Triumph. Status: Active. Payload: 180 kg (390 lb). Location: Moscow, Russian Federation. Apogee: 30 km (18 mi). In 1999 trials began at the test range of a new surface-to-air missile system, the S-400 Triumf. This fourth generation system used S-300 missiles, but possessed capabilities against low RCS stealth aircraft, small cruise missiles, and future low-RCS re-entry vehicles. The electronics were on a completely new technical basis and used new solutions to the detection, tracking, and guidance problems. The system was claimed to represent a bigger step from third generation systems (S-300PMU, S-300PMU-1, S-300PMU-2) than third generation systems represented to first generation systems. However the first trials series, completed in 2003, were unsatisfactory. The Russian government found the new system to be only 10-15% more capable than its predecessors. The decision was taken to replace some of the 48N6E missiles of the system with new versions of the 9M96, which had over double the performance. This combination was found to provide sufficient improvement to justify production. The S-400 featured an unbreakable, unjammable data link from the launcher to the missile in flight. The system consisted of the 48N6E long-range and 9M96 short-range rocket, a multi-target radar, a launcher, and autonomous observation and tracking vehicles. The S-400 was capable of simultaneously tracking and guiding missiles to 12 targets. One SPU launcher had four missile containers; each container could house one 48N6E or four 9M96 surface-to-air missiles. These missiles were not just capable against airborne targets, but also radar stations, command points, strategic bunkers, and re-entry vehicles of intermediate range missies with velocities of up to 4.6 km/s. The system featured a second launcher with midrange missiles, developed by MKB Fakel, which also would serve as the missile for the naval version of the system. These were capable against aircraft, several types of ballistic missiles, and provided echelon defense of military units. The standard launcher had four missiles and could be mounted on heavy chassis of MAZ or KRAZ types. The smaller launcher could be mounted on 3-axle KAMAZ chassis. A typical battery would consist of three launchers, and vehicles with the modular guidance and velocity measurement systems. A single SU consisted of a phased array radar. The radar was carried horizontally for transport, then raised vertically when in use. The missile was guided by an on-board inertial navigation unit with radio command during the cruise phase, and active radar homing in the final approach to the target. 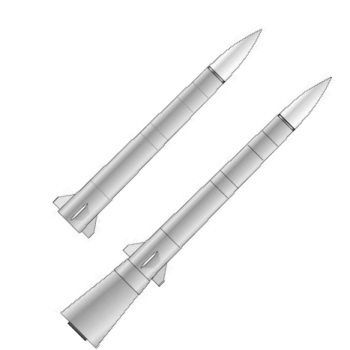 The small-dimension missiles used the universal 9M96E and 9M96E2 rockets developed by MKB Fakel. The system was planned for use by both the VVS and VMF. The missile was cold-launched vertically from the launcher, only igniting and arcing over toward the target when clear of the vehicle. The Triumf had an increased zone of military usefulness compared to second or third generation missiles, and featured use of new mathematical techniques and computer equipment. Radars: 96L6 target acquisition radar, L band, range 300 km. Target acquisition radar, range 700 km. Grave Stone target tracking radar, I/J band, range 300 km. Maximum range: 400 km (240 mi). Minimum range: 1.00 km (0.60 mi). Floor: 5.00 m (16.40 ft). Family: surface-to-air, vehicle-launched. Country: Russia. Agency: Efremov, Lyulev. Bibliography: 563, 571, 8573.